Always aiming high despite keeping both feet firmly on the ground: Stephan Keck, born in Schwaz in Tyrol 1973, is an extreme mountaineer, expedition manager, mountain guide, entrepreneur, photographer and, despite all his adventures, also the caring father of three children and a real family man. Ever since he was a child he has always felt comfortable in extreme environments. Whether on eight-thousanders in the Himalayas, balloon-skiing in his local Alps or going on a six-month African road trip with the entire family in a converted truck. He’s experienced temperatures ranging from minus 48 to plus 47 degrees celsius and was above the magical eight-thousand-meter limit nine times – always by fair means. After finishing school, Stephan Keck completed extensive training with his parents plumbing company including a master craftsman exam. However, the temptation for adventure was already strong and during his training he broke out of the run of the mill life again and again. At the young age of 18 he travelled to Peru for his first major mountain expeditions followed by further spells in the Andean countries of South America. It was here that Stephan Keck’s passion for high altitude mountaineering began and after the end of his first apprenticeship he turned this passion into a profession becoming a certified ski and mountain guide in 2003. In the same year, he founded Alpinist Expeditions and since then, with his team, has been offering expeditions, adventure and winter sport trips worldwide. Just one year later came the the first eight-thousander summit success with the ascent of the Shisha Pangma. Since then he has been on repeated expeditions to the highest mountains of the world from Alaska to Pakistan. He also offers the equipment necessary for such expeditions in his own web-shop Expeditiongear. In 2014, he founded the Bergkult Productions brand and has since then undertaken ambitious photo and film projects such as the Freeride feature film „Heimschnee“ for cinema and TV. All companies, as well as the installation company, which Stephan Keck has now taken over from his father, are now combined under the umbrella of Keck GmbH. Today, Stephan Keck completes marathons in under three hours and proves his endurance in terms of social commitment as well. In 2009, he founded the relief organisation STEPZERO.ONE, which is used to finance the construction of schools and hospitals in Nepal and Pakistan. After the severe earthquake in Nepal in 2015 he also immediately took action with his comrades. Together they collected 65 tons of materials that were most needed, brought them to Nepal and actively took part supporting the reconstruction on site. Out of this initiative came the relief action SOS Nepal, which is still supported today by personalities like Franz Klammer, Axel Naglich and Andi Goldberger. Not only did he bring private individuals on board but he was also able to win over numerous companies who took an active part in the campaign. From skilled craftsman to extreme climber to entrepreneur and inventor of balloon skiing, Stephan Keck is characterised by the courage to put new ideas into practice. Whether it is in the entrepreneurial sense of realising new business ideas or in private life travelling around the world with his wife and children on adventurous explorations in the search for freedom. 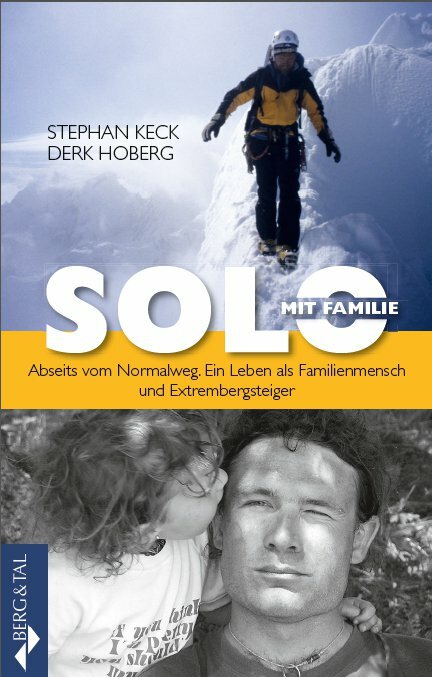 You can find more information about me in my book „Solo mit Familie“.